As of 2018[update], kratom's usefulness and safety as a therapeutic agent is unclear, since research into its use has been of poor quality. In February 2018, the United States' Food and Drug Administration (FDA) stated that there is no evidence that kratom is safe or effective for treating any condition. Some people take it for managing chronic pain, for treating opioid withdrawal symptoms, or – more recently – for recreational purposes. The onset of effects typically begins within five to ten minutes and lasts for two to five hours. Common minor side effects include nausea, vomiting, and constipation. More severe side effects may include respiratory depression (decreased breathing), seizure, addiction, and psychosis. Other side effects may include high heart rate and blood pressure, trouble sleeping, and, rarely, liver toxicity. When use is stopped, withdrawal symptoms may occur. Deaths have occurred with kratom both by itself and mixed with other substances. Over 18 months in 2016 and 2017, 152 overdose deaths involving kratom were reported in the United States, with kratom as the primary overdose agent in 91 of the deaths. Nine kratom-related deaths occurred in Sweden in 2011 and 2012, all involving a mixture of kratom with other opioids. A 2019 report from poison control centers in the United States stated that kratom use was increasing rapidly, with 1807 kratom exposures and a 52-fold increase occurring over the years 2011 to 2017. As of 2018[update], there is growing international concern about a possible threat to public health from kratom use. In some jurisdictions, its sale and importation have been restricted, and several public health authorities have raised alerts. Kratom is a controlled substance in 16 countries and, in 2014, the FDA banned importing and manufacturing of kratom as a dietary supplement. In the United States, there is consideration to make it a Schedule I drug. Sometimes, the finished product is mixed with other psychoactive drugs, such as caffeine and codeine. Mitragyna speciosa is an evergreen tree that can grow to a height of 25 m (82 ft). Its trunk may grow to a 0.9 m (3 ft) diameter. The trunk is generally straight, and the outer bark is smooth and grey. The leaves are dark green and glossy and can grow to over 14–20 cm (5.5–7.9 in) long and 7–12 cm (2.8–4.7 in) wide when fully open, are ovate-acuminate in shape, and opposite in growth pattern, with 12–17 pairs of veins. The flowers grow in clusters of three at the ends of the branches. The calyx-tube is 2 mm (0.08 in) long and has five lobes; the corolla-tube is 2.5–3 millimetres (0.098–0.12 in) long. The United States Drug Enforcement Administration stated in 2013: "There is no legitimate medical use for kratom". Kratom has become popular as a recreational drug and has been promoted with claims that it can improve moods, relieve pain and help with opiate addiction. As of 2013[update], kratom and key extracts have been studied in cells and in animals, but no clinical trials have been conducted in the United States. In Thailand, a 2007 survey found that the lifetime, past year, and past 30 days kratom usage prevalences were 2.32%, 0.81% and 0.57%, respectively, among respondents aged 12–65 years. This made kratom the most widely used drug in Thailand. In cultures where the plant grows, kratom has been used in traditional medicine. The leaves are chewed to relieve musculoskeletal pain and increase energy, appetite, and sexual desire in ways similar to khat and coca. The leaves or extracts from them are used to heal wounds and as a local anesthetic. Extracts and leaves have been used to treat coughs, diarrhea, and intestinal infections. They are also used as intestinal deworming agents in Thailand. Kratom is often used by workers in laborious or monotonous professions to stave off exhaustion as well as a mood enhancer and painkiller. In Thailand, kratom was "used as a snack to receive guests and was part of the ritual worship of ancestors and gods". The herb is very bitter and is generally combined with a sweetener. In 1836, kratom was reported to have been used as an opium substitute in Malaysia. Kratom was also used as an opium substitute in Thailand in the nineteenth century. As of 2016[update], Kratom is not approved for this or any other medical use. Data on how often it is used worldwide are lacking, as it is not detected by typical drug-screening tests. Rates of kratom use appear to be increasing among those who have been self-managing chronic pain with opioids purchased without a prescription and are cycling (but not quitting) their use. As of 2018[update], there have been no formal trials to study the efficacy or safety of kratom to treat opioid addiction. Starting in the 2010s, a tea-based cocktail known as "4×100" became popular among some young people across Southeast Asia and especially in Thailand. It is a mix of kratom leaves, cough syrup, Coca-Cola, and ice. Around 2011, people who consumed the cocktail were often viewed more negatively than users of traditional kratom, but not as negatively as users of heroin. As of 2012[update], use of the cocktail was a severe problem among youth in three provinces along the border of Malaysia and Southern Thailand. In the US, as of 2015[update], kratom was available in head shops and over the Internet; the prevalence of its use was unknown at the time. In July 2016, the Centers for Disease Control issued a report stating that between 2010 and 2015, US poison control centers received 660 reports of exposure to kratom. Medical outcomes associated with kratom exposure were reported as minor (minimal signs or symptoms, which resolved rapidly with no residual disability) for 162 (24.5%) exposures, moderate (non-life-threatening, with no residual disability, but requiring some form of treatment) for 275 (41.7%) exposures, and major (life-threatening signs or symptoms, with some residual disability) for 49 (7.4%) exposures. One death was reported in a person who was exposed to the medications paroxetine (an antidepressant) and lamotrigine (an anticonvulsant and mood stabilizer) in addition to kratom. For 173 (26.2%) exposure calls, no effects were reported, or poison center staff members were unable to follow-up regarding effects. A 2019 report from poison control centers in the United States stated that kratom use was increasing rapidly, with 1807 kratom exposures and a 52-fold increase occurring over the years 2011 to 2017. Most exposures occurred intentionally by adult males in their homes, with 32% of the incidents requiring admission to a health care facility and half of the admissions as a serious medical condition. Multiple-substance exposures were associated with a higher number of hospitalizations than single-substance exposures, and involved 11 deaths, including two due to kratom alone. In rare cases, chronic use of kratom has been linked to acute liver injury with associated symptoms of fatigue, nausea, itching and jaundice. Liver injury is associated with cholestasis and may involve acute renal failure. As of 2016[update], the mechanism by which kratom causes liver damage in some people was poorly understood. Kratom overdose is a subject of concern in many countries because of the rising number of hospitalizations and deaths from chronic kratom abuse. According to clinical reviews, a kratom overdose can cause liver toxicity, seizures, coma, and death, especially when in combination with alcohol abuse. Between 2011 and 2017, forty-four deaths were kratom-related. Kratom overdose is a subject of concern in many countries because of the rising number of hospitalizations and deaths from chronic kratom abuse. According to clinical reviews, a kratom overdose can cause liver toxicity, seizures, coma, and death, especially when in combination with alcohol abuse. Between 2011 and 2017, forty-four deaths were kratom-related. In an analysis of overdose deaths occurring in 27 US states from 2016 to 2017, the CDC found that 152 deaths involved kratom abuse with other agents, while 91 of this total resulted primarily from kratom overdose. Nine deaths occurred in Sweden during 2010-11 relating to use of Krypton, a mixture of kratom, caffeine and O-desmethyltramadol, a prescription opioid analgesic. The key psychoactive compounds in M. speciosa are mitragynine and 7-hydroxymitragynine (7-HMG), but there are more than 40 compounds in M. speciosa leaves, including about 25 alkaloids other than mitragynine and 7-hydroxymitragynine including ajmalicine, mitraphylline, mitragynine pseudoindoxyl, and rhynchophylline. Other active chemicals in M. speciosa include raubasine (best known from Rauvolfia serpentina) and Pausinystalia johimbe alkaloids such as corynantheidine. Mitragynine is about 60% of alkaloid extractions, while 7-hydroxymitragynine is about 2%. Mitragynine is structurally similar to yohimbine and voacangine. As of 2017[update], much of the pharmacology of kratom was not well understood, having stimulant effects at low doses, an opioid-like effect at higher doses, as well as sedative and sensory-suppressive effects. Both mitragynine and 7-HMG have partial agonist activity at nanomolar concentrations at the human μ-opioid receptors; 7-HMG appears to have higher affinity. Other alkaloids have antagonist activity at micromolar concentrations, so effects of whole kratom may result from the interplay of these different alkaloids. Different assays on the human receptor yielded different results, and activities at mouse and guinea pig μ-opioid receptors appear to be different as well, and it is unknown which alkaloids are able to cross the blood brain barrier in humans, making in vitro and animal studies problematic to translate to humans. The binding of kratom alkaloids at human and model animal δ- and κ-opioid receptor subtypes was very unclear as of 2017[update]. Mitragynine also stimulates α2-adrenergic receptors; other compounds in this class include dexmedetomidine which is used for sedation, and clonidine which is used to manage anxiety and some symptoms of opioid withdrawal; this activity might explain why kratom can be dangerous when used in combination with other sedatives. As of January 2018[update], neither the plant nor its alkaloids were listed in any of the Schedules of the United Nations Drug Conventions. As of 2013[update], kratom was listed by ASEAN in its annex of products that cannot be included in traditional medicines and health supplements that are traded across ASEAN nations. As of January 2015[update], kratom was controlled as a narcotic in Australia and under Medicines Regulations 1985 (Amended August 6, 2015) in New Zealand. As of October 2016[update], it was not legal to market kratom for any use in which it was ingested, but could be marketed for other uses, such as incense. Health Canada has taken action against companies marketing it for ingestion. As of 2011[update], the plant was controlled in Denmark, Latvia, Lithuania, Poland, Romania and Sweden. In the UK, since 2016, the sale, import, and export of kratom are prohibited under the Psychoactive Substances Act. In 2017, kratom was designated a Schedule 1 illegal drug (the highest level) in the Republic of Ireland, under the names 7-hydroxymitragynine and mitragynine. The use of kratom leaves, known locally as ketum, is prohibited in Malaysia under Section 30 (3) Poisons Act 1952 and the user may be fined a maximum amount of MYR 10,000 (US$3,150) or up to four years' imprisonment. Certain parties have urged the government to penalize the use of kratom under the Dangerous Drugs Act instead of the Poisons Act, which would carry heavier penalties. Possession of kratom leaves is illegal in Thailand. The Thai government passed the Kratom Act 2486, effective August 3, 1943, which made planting the tree illegal, in response to a rise in its use when opium became very expensive in Thailand and the Thai government was attempting to gain control of the opium market. In 1979, the Thai government placed kratom, along with marijuana, in Category V of a five category classification of narcotics. Kratom accounted for less than 2% of arrests for narcotics between 1987 and 1992. The government considered legalizing kratom in 2004, 2009, and 2013. In 2018 the Thai government legalized the production, import, export, possession and use of kratom products for medicinal purposes. From 2010–2015, kratom-related reports of poisoning in the United States increased 10-fold. Because kratom was being marketed as a dietary supplement in 2014 – but had never been commonly used in the United States or confirmed to be safe – the FDA coordinated with other U.S. agencies to seize imported shipments. Between February 2014 and July 2016, U.S. law-enforcement authorities "encountered 55 tons of kratom," or roughly "50 million individual doses," according to the International Narcotics Control Board. As of July 2018[update], Alabama, Arkansas, Indiana, Vermont, and Wisconsin had made kratom illegal, and the US Army had forbidden soldiers from using it. On August 30, 2016, the Drug Enforcement Administration (DEA) announced its intention to place the active materials in the kratom plant into Schedule I of the Controlled Substances Act as a warning about an imminent hazard to public safety, citing over 600 calls to poison control centers between 2010 and 2015 and 15 kratom-related deaths between 2014 and 2016. This drew strong protests among those using kratom to deal with chronic pain or wean themselves off opioids or alcohol. A group of 51 members of the U.S. House of Representatives and a group of nine Senators each sent letters to acting DEA administrator Chuck Rosenberg protesting the listing and around 140,000 people signed an online White House Petition protesting it. The DEA noted the responses but said that it intended to go forward with the listing; a spokesman said: "We can't rely upon public opinion and anecdotal evidence. We have to rely upon science." In October 2016, the DEA withdrew its notice of intent while inviting public comments over a review period ending on December 1, 2016. On April 4, 2018, the FDA issued the first mandatory recall in its history over concerns of salmonella contamination of several kratom-containing products. Samples of the products, manufactured by Triangle Pharmanaturals, and marketed under the brand name 'Raw Form Organics', tested positive for contamination and the manufacturer did not comply with federal requests for voluntary recall. FDA Commissioner Gottlieb stated that the recall was, "...based on the imminent health risk posed by the contamination of this product with salmonella" and not related to other regulatory concerns. Consumers were advised to immediately discard any such products to prevent serious health risks. ^ a b c d e f g h i j k l m n o "Kratom profile (chemistry, effects, other names, origin, mode of use, other names, medical use, control status)". Page last updated 8 January 2015: European Monitoring Centre for Drugs and Drug Addiction. Retrieved 12 September 2016. ^ a b c d e f g h i j k l m n o p q r s t u v w x y z aa Warner ML, Kaufman NC, Grundmann O (2016). "The pharmacology and toxicology of kratom: from traditional herb to drug of abuse". Int. J. Legal Med. (Review). 130 (1): 127–38. doi:10.1007/s00414-015-1279-y. PMID 26511390. ^ a b c d e f Adkins, Jessica E.; Edward W. Boyer; Christopher R. McCurdy (2011-05-01). "Mitragyna speciosa, a psychoactive tree from Southeast Asia with opioid activity". Current Topics in Medicinal Chemistry. 11 (9): 1165–75. doi:10.2174/156802611795371305. PMID 21050173. ^ a b c d e f g h i j Hassan, Z; Muzaimi, M; Navaratnam, V; Yusoff, N. H; Suhaimi, F. W; Vadivelu, R; Vicknasingam, B. K; Amato, D; von Hörsten, S; Ismail, N. I; Jayabalan, N; Hazim, A. I; Mansor, S. M; Müller, C. P (2013). "From Kratom to mitragynine and its derivatives: Physiological and behavioural effects related to use, abuse, and addiction". Neuroscience & Biobehavioral Reviews. 37 (2): 138–51. doi:10.1016/j.neubiorev.2012.11.012. PMID 23206666. ^ Department of Health and Aging Therapeutic Goods Administration (26 February 2004). National Drugs and Poisons Schedule Committee (PDF). 40th meeting. Government of Australia. pp. 103–105. ^ "Unauthorized "Sāj" kratom products seized from two Edmonton stores may pose serious health risks". Health Canada. Canada. 4 May 2018. Retrieved 8 August 2018. ^ a b Tave, Steven J. (26 February 2018). "FDA warning letter to Industrial Chemicals, LLC, and INI Botanicals" (PDF). Office of Dietary Supplement Programs, Center for Food Safety and Applied Nutrition, US Food and Drug Administration. Retrieved 7 March 2018. ^ "Mitragyna speciosa". Germplasm Resources Information Network (GRIN). Agricultural Research Service (ARS), United States Department of Agriculture (USDA). Retrieved 2013-12-26. ^ a b c d e f g h i j k l Rech, MA; Donahey, E; Cappiello Dziedzic, JM; Oh, L; Greenhalgh, E (February 2015). "New drugs of abuse". Pharmacotherapy. 35 (2): 189–97. doi:10.1002/phar.1522. PMID 25471045. ^ a b c d e f Fluyau, D; Revadigar, N (2017). "Biochemical Benefits, Diagnosis, and Clinical Risks Evaluation of Kratom". Frontiers in Psychiatry. 8: 62. doi:10.3389/fpsyt.2017.00062. PMC 5402527. PMID 28484399. ^ a b c d e f g h i j Gottlieb, Scott (6 February 2018). "Statement from FDA Commissioner Scott Gottlieb, M.D., on the agency's scientific evidence on the presence of opioid compounds in kratom, underscoring its potential for abuse". US Food and Drug Administration. Retrieved 6 February 2018. ^ a b c d Cinosi, E; Martinotti, G; Simonato, P; Singh, D; Demetrovics, Z; Roman-Urrestarazu, A; Bersani, F. S; Vicknasingam, B; Piazzon, G; Li, J. H; Yu, W. J; Kapitány-Fövény, M; Farkas, J; Di Giannantonio, M; Corazza, O (2015). "Following "the Roots" of Kratom (Mitragyna speciosa): The Evolution of an Enhancer from a Traditional Use to Increase Work and Productivity in Southeast Asia to a Recreational Psychoactive Drug in Western Countries". BioMed Research International. 2015: 1–11. doi:10.1155/2015/968786. PMC 4657101. PMID 26640804. ^ a b White CM (2017). "Pharmacologic and clinical assessment of kratom". Am J Health Syst Pharm (Review). 75 (5): 261–267. doi:10.2146/ajhp161035. PMID 29255059. ^ a b c d e "KRATOM (Mitragyna speciosa korth)" (PDF). U.S. Drug Enforcement Administration. January 2013. Archived from the original (PDF) on 11 June 2016. ^ a b c Marx, John; Walls, Ron; Hockberger, Robert (2014). "Chapter 156: Hallucinogens". Rosen's emergency medicine : concepts and clinical practice (Eighth ed.). London: Elsevier Health Sciences. pp. 2015–23. ISBN 9781455749874. ^ a b c d e f g "Kratom". LiverTox, National Library of Medicine, US National Institutes of Health. 9 March 2017. Retrieved 29 March 2017. ^ a b c d e Anwar, Mehruba; Law, Royal; Schier, Josh (2016-01-01). "Notes from the Field: Kratom (Mitragyna speciosa) Exposures Reported to Poison Centers – United States, 2010–2015". MMWR. Morbidity and Mortality Weekly Report. 65 (29): 748–49. doi:10.15585/mmwr.mm6529a4. ISSN 0149-2195. PMID 27466822. ^ a b c "Mitragynine". Toxnet, National Library of Medicine, US National Institutes of Health. 14 February 2012. Retrieved 15 February 2018. ^ Mari A. Schaefer (April 13, 2019). "CDC: Kratom linked to 91 U.S. overdose deaths". Lodi News-Sentinel. The Philadelphia Inquirer. p. 16. ^ a b c d Post, Sara; Spiller, Henry A.; Chounthirath, Thitphalak; Smith, Gary A. (20 February 2019). "Kratom exposures reported to United States poison control centers: 2011–2017". Clinical Toxicology: 1–8. doi:10.1080/15563650.2019.1569236. ISSN 1556-3650. PMID 30786220. ^ a b c "DEA Announces Intent to Schedule Kratom: SE Asian drug is imminent hazard to public safety". US Drug Enforcement Administration. 30 August 2016. Archived from the original on 15 September 2016. Retrieved 31 August 2016. ^ a b c "Import Alert 54-15; Detention without physical examination of dietary supplements and bulk dietary ingredients that are or contain Mitragyna speciosa or kratom". U.S. Food and Drug Administration. 20 December 2016. Retrieved 7 March 2018. ^ "HHS recommended that the DEA ban kratom, documents show - STAT". STAT. 9 November 2018. Retrieved 15 November 2018. ^ Karch, Steven B.; Drummer, Olaf (2015). Karch's Pathology of Drug Abuse (Fifth ed.). CRC Press. p. 528. ISBN 9781439861479. ^ a b c d e f g Eisenman, Sasha W. (2014). "Chapter 5. The Botany of Mitragyna speciosa (Korth.) Havil. and Related Species". In Raffa, Robert B. (ed.). Kratom and Other Mitragynines: The Chemistry and Pharmacology of Opioids from a Non-Opium. CRC Press. pp. 57–76. ISBN 978-1-4822-2519-8. ^ Singh, Darshan; Narayanan, Suresh; Vicknasingam, Balasingam (September 2016). "Traditional and non-traditional uses of Mitragynine (Kratom): A survey of the literature". Brain Research Bulletin. 126 (Pt 1): 41–46. doi:10.1016/j.brainresbull.2016.05.004. PMID 27178014. ^ Tanguay, Pascal (April 2011). "Kratom in Thailand: Decriminalisation and Community Control?" (PDF). Transnational Institute. Young people feel the need to drink 4x100 in hidden settings due to fears of arrest by law enforcement. In one district, 21 of 39 villages reported the presence of 4x100 users in their community. Compared to traditional use, 4x100 users are subject to some measure of community discrimination, though community perceptions are far milder than for yaba or heroin users. ^ Fuller, Thomas (23 July 2012). "A Fading Thai Drug Finds Its Resurgence in a Cocktail". The New York Times. ^ a b "Multistate Outbreak of Salmonella I 4,,12:b:- Infections Linked to Kratom Products | February 2018 | Salmonella". cdc.gov. Centers for Disease Control. 20 February 2018. Retrieved 22 February 2018. ^ a b c Beckett, Jaclyn R. (2014). "Non-Analgesic CNS Effects". In Raffa, Robert B. (ed.). Kratom and other mitragynines : the chemistry & pharmacology of opioids from. CRC Press. pp. 195–204. ISBN 9781482225181. ^ a b c d Rosenbaum CD, Carreiro SP, Babu KM (2012). "Here today, gone tomorrow…and back again? A review of herbal marijuana alternatives (K2, Spice), synthetic cathinones (bath salts), kratom, Salvia divinorum, methoxetamine, and piperazines". Journal of Medical Toxicology. 8 (1): 15–32. doi:10.1007/s13181-011-0202-2. PMC 3550220. PMID 22271566. ^ Nelson, Michael E.; Bryant, Sean M.; Aks, Steven E. (2014). "Emerging Drugs of Abuse". In Smith, Silas W.; Lugassy, Daniel M. (eds.). Clinical Toxicology, An Issue of Emergency Medicine Clinics of North America, Volume 32, Issue 1 of The Clinics: Internal Medicine. Elsevier Health Sciences. pp. 1–28. ISBN 9780323266550. ^ a b Pantano, F; Tittarelli, R; Mannocchi, G; Zaami, S; Ricci, S; Giorgetti, R; Terranova, D; Busardò, FP; Marinelli, E (16 April 2016). "Hepatotoxicity Induced by "the 3Ks": Kava, Kratom and Khat". International Journal of Molecular Sciences. 17 (4): 580. doi:10.3390/ijms17040580. PMC 4849036. PMID 27092496. ^ Suhaimi FW, Yusoff NH, Hassan R, Mansor SM, Navaratnam V, Müller CP, Hassan Z (2016). "Neurobiology of Kratom and its main alkaloid mitragynine". Brain Res Bull. Mar 25 (Pt 1): 29–40. doi:10.1016/j.brainresbull.2016.03.015. PMID 27018165. ^ Prozialeck, WC; Jivan, JK; Andurkar, SV (2012). "Pharmacology of kratom: an emerging botanical agent with stimulant, analgesic, and opioid-like effects". The Journal of the American Osteopathic Association. 112 (12): 792–99. PMID 23212430. ^ Takayama, Hiromitsu; et al. (2002). "Studies on the Synthesis and Opioid Agonistic Activities of Mitragynine-Related Indole Alkaloids: Discovery of Opioid Agonists Structurally Different from Other Opioid Ligands". Journal of Medicinal Chemistry. 45 (9): 1949–56. doi:10.1021/jm010576e. PMID 11960505. ^ Le D, Goggin MM, Janis GC (2012). "Analysis of mitragynine and metabolites in human urine for detecting the use of the psychoactive plant kratom". Journal of Analytical Toxicology. 36 (9): 616–25. doi:10.1093/jat/bks073. PMID 23024321. ^ Baselt RC (2014). Disposition of toxic drugs and chemicals in man. Seal Beach, Calif.: Biomedical Publications. p. 1382. ISBN 978-0-9626523-9-4. ^ a b c d Kruegel AC, Grundmann O (2017). "The medicinal chemistry and neuropharmacology of kratom: A preliminary discussion of a promising medicinal plant and analysis of its potential for abuse". Neuropharmacology. 134 (A): 108–20. doi:10.1016/j.neuropharm.2017.08.026. PMID 28830758. ^ a b White, CM (1 March 2018). "Pharmacologic and clinical assessment of kratom". American Journal of Health-System Pharmacy. 75 (5): 261–267. doi:10.2146/ajhp161035. PMID 29255059. ^ "Annex I: ASEAN Guiding Principles For Inclusion into or Exclusion from the Negative List of Substances for Traditional Medicines and Health Supplements" (PDF). Association of South East Asian Nations (ASEAN). June 28, 2014. Retrieved September 12, 2016. ^ "Medicines Regulations 1984". New Zealand Legislation. Retrieved 31 May 2017. ^ Coles, Terri (14 October 2016). "After U.S. delayed decision on kratom, a look at Canada's laws on the psychadelic plant". Yahoo News Canada. ^ "Health Product Advertising Complaints". Health Canada, Health Products and Food Branch. Archived from the original on 14 February 2017. ^ Phil Heidenreich (27 June 2017). "Kratom, a controversial herbal product, seized from 2 Edmonton stores: Health Canada". Global News. ^ "Psychoactive Substances Act 2016". The National Archives, HM Government Publishing. 9 September 2016. ^ "MISUSE OF DRUGS (DESIGNATION) ORDER 2017" (PDF). STATUTORY INSTRUMENTS, S.I. No. 174 of 2017. Stationery Office, Dublin. 2017. ^ Prasert, Poungchompoo (October 4, 2013). 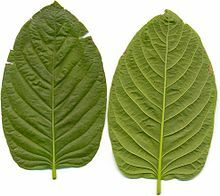 "Decision yet to be reached on making 'kratom' legal". The Nation (Thailand). ^ "Thailand legislature legalises medical cannabis and kratom". Aljazeera English. 26 December 2018. Retrieved 26 December 2018. ^ "Product Seizure Shows FDA Serious about Kratom". Natural Products Insider. 9 January 2016. ^ Smith, Peter Andrey (2019-02-19). "The Herbal Supplement That Might Be a Deadly Drug". Outside Online. Retrieved 2019-02-20. ^ Brown, Melissa (May 20, 2016). "States ban kratom supplement over abuse worries". Associated Press via US News & World Report. ^ Schwarz, Alan (2 January 2016). "Kratom, an Addict's Alternative, Is Found to Be Addictive Itself". The New York Times. ^ Silverman, Lauren (12 September 2016). "Kratom Advocates Speak Out Against Proposed Government Ban". NPR. Retrieved 12 September 2016. ^ Ingraham, Christopher (September 30, 2016). "DEA defies senators' appeal to reconsider 'unprecedented' kratom ban". Washington Post. ^ Stapleton, Christine (September 29, 2016). "Congress members ask DEA not to ban kratom: opioid research needed". Palm Beach Post. ^ Nelson, Steven (September 30, 2016). "Kratom Will Remain Legal for Days, Possibly Longer". US News & World Report. ^ "Kratom Gets Reprieve From Drug Enforcement Administration". NPR.org. Retrieved 2016-10-12. ^ "Withdrawal of Notice of Intent to Temporarily Place Mitragynine and 7-Hydroxymitragynine Into Schedule I: A Proposed Rule by the Drug Enforcement Administration on 10/13/2016". Federal Register. Drug Enforcement Administration. 2016-10-13. Retrieved 2016-10-18. ^ a b Chappell, Bill (4 April 2018). "FDA Orders An Unprecedented Recall After Kratom Company Ignored Its Requests". NPR. Retrieved 5 April 2018. ^ a b FDA News Release. "FDA orders mandatory recall for kratom products due to risk of salmonella". Press Announcements. United States Food and Drug Administration. Retrieved 5 April 2018. Scholia has a topic profile for Mitragyna speciosa.